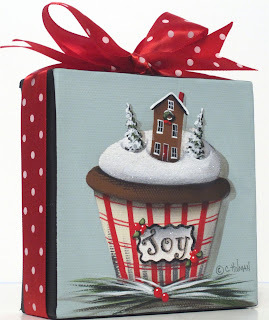 I finished two little Christmas cupcake paintings yesterday and got them listed on eBay. I love using glitter on these little paintings! Click on the pictures for a closer view. 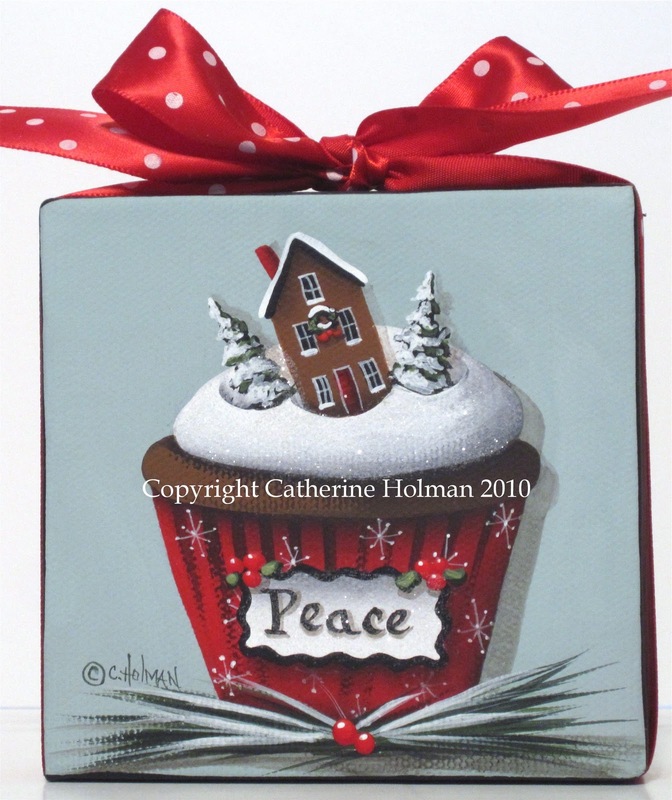 A tiny gingerbread house is tucked into this marshmallow creme frosting along with two little evergreen trees. This cupcake sparkles with glitter applied to the frosting and the "Joy" label. A red and white dotted ribbon is wrapped around the edges of the canvas and tied in a bow at the top. A tiny gingerbread house is tucked into this marshmallow creme frosting along with two little evergreen trees. 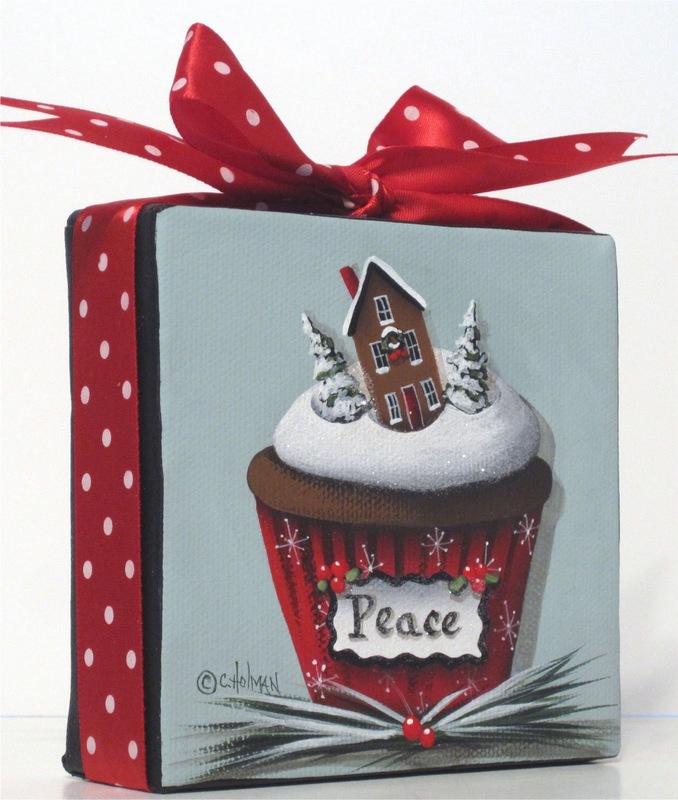 This cupcake sparkles with glitter applied to the frosting and the "Peace" label. Today I'm working on a Gingerbread Bakery painting and it's going to be so much fun! Love, Peace and Chocolate. Yeah! 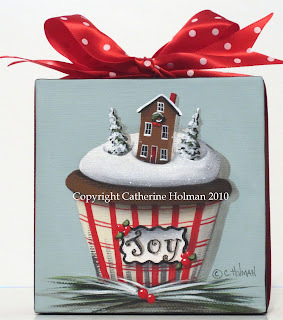 Love those holiday cupcakes! As usual Cathie-they are so creative and lovely! The combination of cupcakes and a house topper is so cute. I love them! Hi Cathy! I haven't been by in awhile. You're cupcake is darling! I love how you capture such magic in your paintings! 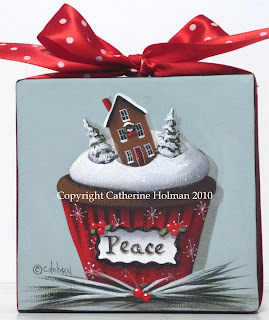 Catherine, I love this set of paintings and the fact that you accented the artwork with glitter, that is perfect for the holidays. Oh now that's adorably clever! I love it!